For those of you who haven’t yet been lucky enough to meet him, Mike Copperman is a cigar god amongst men. This pleasant and approachable tobacconist at Bethesda Tobacco has more passion and knowledge about stogies in his little finger than I have in my entire body. On Saturday morning, he was generous enough to invite Patrick and me to his store for a private Davidoff tasting. As expected, we got some wonderful cigars and tons of invaluable knowledge out of the experience…But we also got so much more. After four cups of coffee, one bagel, and a sixty minute commute, Patrick and I rolled into Bethesda Tobacco at 10:30 AM on Saturday. The building is a tiny, two-story dwelling that is as unassuming as it is charismatic. The front patio is dotted with deck furniture sitting in the shade of tropical banana trees. A lone neon sign glowing through the main window simply reads, “Cigars”. Mike welcomed us with a smile and led us to a lounge on the second floor. This small stogie haven – complete with leather chairs, a television, a huge humidor, and jaded windows fogged by decades of smoke – would be our refuge for the next two hours. The session consisted of us tasting three different Davidoff cigars, each one comprised entirely of one tobacco blend – Olor, San Vicente, and Piloto Cubano. After each sampling, Patrick and I gave the cigar a rating based on sweetness, saltiness, acidity, and bitterness. With a lot of help from Mike, and a trusty palate diagram of the human tongue, we correctly identified the Olor blend as mostly salty (removes saliva from the mouth), the San Vicente blend as mostly acidic (adds saliva to the mouth), and the Piloto Cubano blend as bitter and sweet. It’s amazing how refined your palate can be if you (1) pay attention to the geography of your tongue, (2) smoke through the nose (no, it’s not inhaling, Stogie Tip forthcoming), and (3) have a human cigar encyclopedia at your disposal. Next, Mike presented us with the fourth cigar – the highly acclaimed Davidoff Gran Cru No. 3. This robust smoke is a special blend of the three aforementioned stogies we had just sampled. The five inch by 43 ring gauge smoke is a noble cigar: smooth and well-refined with a wonderful flavor curve that balances evenly amongst the palate. While we smoked, Mike was nice enough to share some fantastic tips with us. For example, did you know that in order to get maximum flavor out of each cigar you should only take about two puffs per minute? 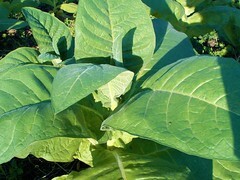 You see, tobacco leaves are harvested to create starch so the leaf can produce sugar. When you smoke a cigar, the sugar is caramelized. Much like a master chef cooks a soufflé, you must “cook” the cigar at the right temperature. Taking about two puffs a minute will keep the foot at 494° F, the optimum temperature for experiencing maximum flavors. But the best tip Mike shared with us is much less technical. He explained that the greatest sense one needs in order to enjoy cigars is not on the tongue or in the nose…It’s between the ears. In other words, the more you know about tobacco and cigar composition, the better tools you have with which to appreciate each smoke. Overall, the whole tasting was a tremendous experience. I will remember the morning of Saturday, July 29 for many years to come. I highly recommend Stogie Guys in the DC area make the trip to Bethesda when they can (a Thursday, August 3 Ashton BBQ would be a great introductory event). Take some time to peruse their selection, mingle with friendly regulars (who always come out in good numbers), and – of course – meet Mike Copperman. Also, for those DC Stogie Guys who are interested in setting up a private tasting of your own with Mike, visit Bethesda Tobacco online and contact Mike. Sounds amazing. Next time I’m in the states I’ll go. Just a quick correction you may want to make…the Ashton event is on Thursday, August 3rd. No problem. You guys planning on being in the house on Thursday? I’m not sure yet, depends on actually how hot it gets. I’m hoping Mike’s successful in getting his hands on the Ashton ESG in time for the event. So not to be a downer, but the tongue doesn't actually work like that. The Dr who came up with that little map had his work discredited long ago, and I believe he himself discredited it, too. but mind over matter, that's what I always say.